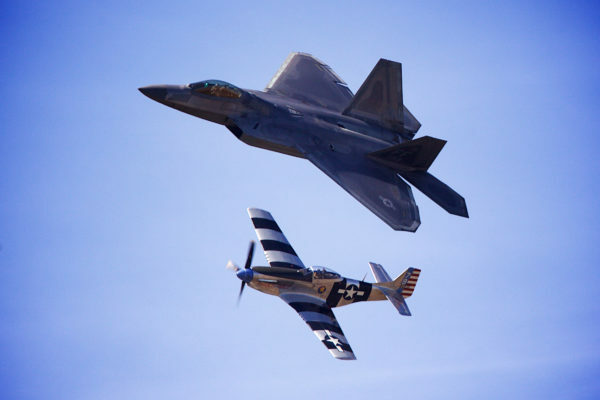 A modern U.S. Air Force F-22 Raptor flies along side it's WWII predecessor, a P-51 Mustang, at the Great State of Maine Air Show in Brunswick, Sept. 5, 2015. For many Maine residents, Saturday was full of high-flying entertainment as the Blue Angels and more soared over the Brunswick Executive Airport. The performance was a part of the Great State of Maine Air Show, which featured pilots and planes from all over the country. “We came when we were kids and enjoyed it so much that we knew these guys would enjoy it,” said Jason Rideout holding his son Cameron. Rideout’s sister Brittany held his other son Liam. He said that watching the Blue Angels and others perform their acrobatic feats are a once in a lifetime experience. “It’s a great accomplishment to see the planes and the equipment that we have [in the United States],” he said. Others, like New Hampshire resident Elizabeth Estabrook, said that they were awestruck by the amount of patriotism shown during the ceremonies. “I love it, we should be out there supporting them, showing them how proud they are, and this is how they are doing it,” she said. She said that some of her family members served in the military, and that this show encapsulated how important shows like this can be for her and her family. “It’s just thrilling. We used to see these as a little girl with my dad. He used to take us as a family. It just wows you what they can do,” she said. Not everyone at the Brunswick Executive Airport agreed. About two dozen people lined the entrance to the airport with signs to protest the show. “We’ve got to stop the military industrial complex. They benefit from [shows] like this,” said Susan Headrich, one of the protesters. “It shows the extent of the propaganda that the government uses to essentially brainwash the American people into this false notion that our war machine is about freedom and democracy. But in fact, it has nothing to do with that at all,” said Bruce Gagnon, a member of Veterans for Peace. Gagnon and others stood outside the entrance for more than three hours. Attendees of the airshow said that they don’t agree at all, and that the display was nothing more than family-friendly fun. “It’s a great experience, and I think [my kids] will remember it for a long time,” Rideout said. “I’m very proud of our military, and what they’ve accomplished. This is just another example of the pride we have here,” Estabrook said. The show lasted for about six hours. It returned for another run Sunday.